Thanks to scientists on the Dark Energy Survey (DES), the solar system just got another member. DES scientists recently reported the discovery of a potential dwarf planet located 92 times farther from the sun than the Earth is, more than twice as distant as Pluto. The new dwarf planet was discovered using the Dark Energy Camera, a scientific instrument built at Fermilab to probe the mystery of dark energy. But as scientists on the DES collaboration can attest, DECam turns out to be a powerful tool for astronomy as well as cosmology. The newly discovered object, which the team has nicknamed DeeDee (for “distant dwarf”), is for now known as 2014 UZ224. DeeDee takes more than 1,100 years to complete one orbit around our sun and is currently the second-most distant known object in the solar system. Light from DeeDee takes 12-and-a-half hours to reach us. DeeDee is one of many small icy worlds that lie beyond the most distant planet in the solar system, Neptune. Such celestial bodies are called trans-Neptunian objects, or TNOs, the most famous of which is the dwarf planet Pluto. TNOs are “cosmic leftovers” from the formation 4 billion years ago of the giant planets, such as Jupiter and Neptune, and scientists study them to learn more about the history of our solar system. David Gerdes and his students at the University of Michigan first spotted DeeDee as a moving spot of light that appeared in just 14 of the tens of thousands of pictures taken by the Dark Energy Survey. 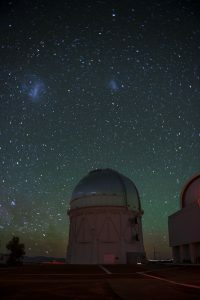 The DES collaboration uses the state-of-the-art Dark Energy Camera on a telescope in Chile to map distant galaxies, to find supernovae and to search for patterns in the cosmic structure. DES began observing the sky in 2013 with the goal of shining light on dark energy, the mysterious substance that is accelerating the expansion of the universe, and collaboration scientists are primarily engaged in that task. Trans-Neptunian objects are not part of DES’ main science interests since they don’t tell us about the universe’s expansion. The DES supernova search, which takes pictures of the same part of the sky every week, sparked a bright idea in Gerdes: Instead of searching for spots that change their brightness over time, his students would search for spots whose positions change over time. Although DES looks at faraway galaxies, the backyard that is our own solar system is part of every picture the telescope takes. A dwarf planet could be captured in the DES data — one just had to look for it in the right way. Gerdes and his collaborators Masao Sako and Gary Bernstein at the University of Pennsylvania employed a technique developed for DES supernova searches and adjusted it to find slow-moving objects. For DeeDee to be a dwarf planet, it has to fulfill four criteria: First, it must orbit the sun. Second, it cannot be a planet’s satellite, such as our moon. Third, it can’t have attracted other objects along its orbit to become its satellites, nor can it have forced their orbits out of its way. This is the major difference between a dwarf planet and a full-fledged planet. Since Pluto’s orbit is tied to Neptune’s, by this criterion Pluto was demoted to dwarf planet status. And last but not least, it has to have enough mass so that its own gravitational force compacts it into a spherical shape. DeeDee easily checks the first three qualifications, but its shape is not yet confirmed. The team speculates that DeeDee is round because it has a diameter of about 350 miles, which means that it likely has enough mass, and therefore enough gravitational force, to be spherical. Gerdes and his team are currently analyzing additional data from a radio telescope to determine its size. So far DeeDee’s chances of joining the elite group of dwarf planets are good. It might even earn its own mythological name, such as the dwarf planets Eris and Haumea, named after the ancient Greek goddess of discord and strife and the Hawaiian goddess of childbirth and fertility, respectively. DES uses the Dark Energy Camera to take its awe-inspiring pictures of the cosmos. The camera is mounted on the Victor M. Blanco 4-meter Telescope at the Cerro Tololo Inter-American Observatory in the Chilean Andes mountains. Fermilab, with the support of DOE’s Office of Science, led its construction and plays a major role in the DES data analysis, with a focus on illuminating the dark universe. Not every bright dot is actually a star or a galaxy, or even a TNO. It could also be an artifact or a reflection of light created by the camera. “You need to know what you are searching for, then you can formulate your question correctly for the data at hand and pull out from the multitude a sensible and manageable number of candidates,” said Jim Annis, Fermilab senior scientist. The number of possible objects in the DES data set easily approaches a billion, so thorough and reliable data sorting is critical to find promising candidates. Wester and Annis are well-practiced in similar exercises, having been involved in many different searches across the DES collaboration. DeeDee’s discovery is more than just that — it is another step on the way to a greater possible discovery: Planet 9. Planet 9 is a hypothetical ninth planet at the edge of our solar system with 10 times the mass of Earth. Otherwise unexplained patterns in the orbits of the largest-orbit TNOs hint at its existence. This opens the possibility that Planet 9 itself could be captured in the DES data, as in DeeDee’s case. The scientists of the DES collaboration, both at Fermilab and at its other 24 partner institutions, continue to mine the three years’ worth of data they’ve already collected and will gather more data through its conclusion in 2018. DeeDee is just one more of many discoveries to come.